URBANA, Ill. – The Illinois softball team used a three-run seventh inning rally – capped by freshman Kailee Powell's walk-off single – to earn a 6-5 come-from-behind victory over No. 23 Wisconsin and take its first Big Ten Conference series win of the season on Sunday (March 24) afternoon at Eichelberger Field. The Illini earned their 20th win of the season after having to delay the game by approximately two hours due to rain and improve to 20-7 and 2-1 in the league after the opening weekend of conference action. "We showed a ton of fight in the bottom of the seventh to win the game," said head coach Tyra Perry. "Our seniors Kiana Sherlund, Annie Fleming and Veronica Ruelius showed a ton of poise with two outs to set the table. It is no surprise to me that Kailee Powell came through with a big hit. She works hard to be the best and brings positive energy to our team." Trailing 5-3 in the bottom of the seventh inning and down to their final out, the Illini got back-to-back singles from senior Kiana Sherlund and redshirt-senior Annie Fleming, before sophomore Bella Loya doubled to left field to score Sherlund. After senior Veronica Ruelius was issued a walk to load the bases, Fleming came home on a passed ball to tie things up at 5-5. From there, it was all Powell as the freshman knocked in the winning run with a single right centerfield. Both teams opened the first frame with solo home runs, including Ruelius' third dinger of the week, the Badgers jumped out to a 3-1 advantage with two-run third inning. An RBI groundout from sophomore Bella Loya in the bottom of the third then closed the deficit to one at 3-2. An RBI double from the Badgers pushed the score to 4-2 in the fifth, but again the Illini answered back as redshirt-senior Carly Thomas scored on a wild pitch for the second-straight game. UW then added an insurance run on a second Illini error in the top of the sixth for the 5-3 lead. Freshman Sydney Sickels (12-3) picked up the win after allowing no hits and only two walks and striking out one in 1.2 innings of relief action. Senior Emily Oestreich (1 ER, 2 H, 1 BB, 1 K, 1.1 IP) started the series finale, before classmate Taylor Edwards (4 R, 3 ER, 1 BB, 1 K) entered in the second inning and went four innings. Both teams totaled eight hits on the day, with the Illini committing two errors to the Badgers' one. Sherlund led the Illini with a 3-for-4 performance at the plate that included one double as well as two runs scored, while Loya added a hit and two RBI and Ruelius turned in a hit, a run and an RBI in the win. 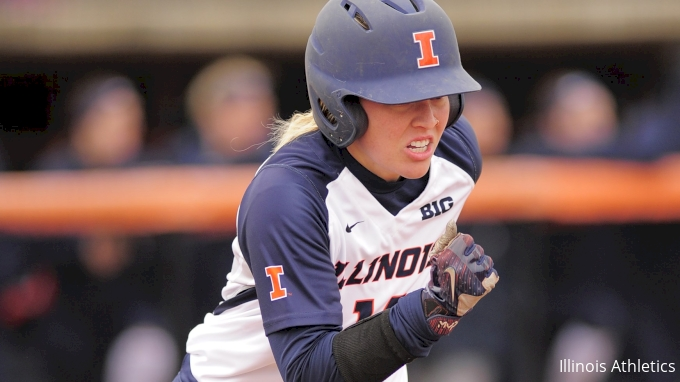 The Illini finish up their seven-game homestand at Eichelberger Field with a Tuesday (March 26) match-up against Eastern Illinois at 5 p.m. CT.
For more Fighting Illini softball news, stay tuned to FIGHTINGILLINI.com and follow @IlliniSB on social media: Instagram | Twitter | Facebook.